A very quiet spot at the south-east coast of Crete greece about 16 kilometers east of Ierapetra and near Aghia Fotia, with beautiful bays and beaches and a beautiful back country for good walk. The town is like a ribbon along the sea built up and has several restaurants, cafes, terraces and some super markets. Again, no mass tourism. There is a moderate bus service to Sitia and Ierapetra, we suggest you here is to rent a car to the beautiful inland to discover. Over 9 kilometers from the place Adele Rethymnon. This is not so much to see, it's just a bad place with not too many sights of interest. What is one important fact is Adele is that Costa Giamboudakis born, the hero of the monastery. He is the man who lit fuse in the Kruidvat. When his house is a memorial plaque. The real lives of tourists Adele plays more in the village Stavromenos slightly north. Recommended, one of the most beautiful bays of southern Crete is a very quiet place 12 km east of Ierapetra, between places and Ferma Achlia. It lies in a valley, adjacent to the beautiful beach. The tiny village has a few restaurants with a terrace and a mini market, a few hundred meters. The other facilities (large supermarket, etc.) for about 20 minutes. We recommend using a moped or car to rent for some to move. Really a place to rest all of your holiday enjoyment or even long walk in the beautiful country behind it. Only in the week ends and in the high season, the printer with what essentially Greeks, who come here to swim, fish and snorklen. The bus stop for the bus to Ierapetra and Sitia is near the apartments. At a unique point on the beach and the sea, you will find very beautiful, nice accommodations with a fantastic sea view. From the accommodation you need only the small stairs going to the closest small restaurant and beautiful beach. Agia Galini on the south coast is very popular for many years, especially in our eastern neighbors. The village lies at the end of the Messara plain. Until recently it was still very difficult to find room for some years but since the economy fell to the Germans, took the tourism in Aghia Galini off. But other countries have now also discovered the beautiful village. It is now so busy that the pressure at room. If the village from above through the narrow streets to go down it seems as if nothing else than hotels and a sprinkling of houses with room rental, and that is true. Once a small fishing village was long zamer hand tourism corridor and could extend only to top .. However, the original core of the village as it was for many years, a row of houses, a fishing port with a long pier where they have a quiet evening walk can make. There is in Agia Galini place for each reentrant. Aghelagia, lagia, a beautiful picturesque village in a large bay surrounded by olive trees and wine groves. Aghia Pelagia is a nice Greek village with a beautiful fine sand beach where various water sports activities are offered. Also located directly behind the beach, many restaurants with terraces. If from the fast way is to drive one sees the village are below. It offers a breathtaking sight. The center of the village is very nice with many shops, bars and discos mortgages are at the beach. The environment is beautiful, a ride around here, along the rocky coast with its small bays, is an absolute must. Even walkers can pretty much walk routes. Each hour is a bus to Heraklion Chania Balos. Aghios Nikolaos is its beautiful location between the high rock walls almost unique. From rock walls and through the streets of the mountain you will slowly end to the inner port reference, formerly Mandrake Raki called, just as you also to Rhodes or Kos and other Greek islands will face. By nowadays is called the inner harbor Voulismeni. The Mandr�ki or Voulismeni was in the years 1867 and 1871 with one channel connected to the open sea. It often claims that the lake bottom would be but a British researcher has with sound in 1853 the depth of the lake measured about 65 meters. Not so of soil, but quite deep, and the mythological goddess Athens service has also swum the current population can not swim in the lake. The Easter celebrations around the world is more widely known, from many countries to be more in the Easter period. Aghios Nikolaos is a real (mundane) tourist area with many restaurants, hotels, bars and shops. It is still the archeo-logical museum and of course the boat ride on Dimitri Dialinas everything out and going on to Spinalonga. In the Minoan period Amnissos was the main port of Knossos, although they have nothing against nowadays more find, apart from a Minoan ruins. In nowadays it is a bad place without allure that most residents of Heraklion days spend their Sunday. Something beyond Amnissos is the beach of Tobrouk also a great beach with some good fish restaurants. The next village is Eros Kart with more accommodation than in the previously mentioned places, and for those who prefer not to lie on the beach or sit, there is a pretty big city (Heraklion) on stone throw away. A very lively town on the coast, 6 km. west of the main city of Heraklion located. It has a beautiful long sandy beach of 2 km. Here you can splendid long beach walk. Also you can practice many water sport activities. The coast road runs through the town and on both sides of the road are many restaurants, local taverna's, shops, bars and discos full atmosphere mortgages. This village is very popular with the Greeks, they come regularly to eat and to go. Every half hour is a bus to Heraklion, where you will find plenty of sights of interest such as fishing port with the colored fishermen boats on a daily fresh fish catch for you, or the Greek market and the many modern shops. 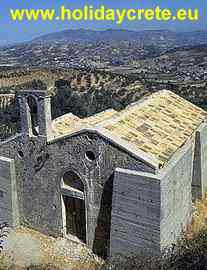 An�lipsi is an example of how it can go between the old Greek villages and modern life for tourism. In other words freedom and modern Greek score tourism can go together. That is precisely why it is a lovely village, where the good life. The beach is full, the nightlife is classic and modern, a place to relax and yet so close to the exciting life of Hersonissos as if one really wants out. The beach of An�lipsi is a wide sandy beach lying on chairs and umbrellas are rented. Between An�lipsi and Hersonissos is the place Anisaras. Anissaras is a new holiday village in a few years ago did not exist. There are many new hotels and a little less apartments. One can see everything that is still in development, but construction activities are during the season just place. It is still very quiet, so much nightlife is not here, but at a stone throw distance from Hersonissos offsets it is more than enough. Highly recommended is the boulevard of Anisaras, where there is (albeit limited) car traffic goes along. The beach of Anisaras is quite wide and, in most places well maintained. In the place Kokkini, coming along the old road from Heraklion right leads towards Anopolis. Anopolis is an old Greek village where time seems to have stopped. Narrow streets with white houses in the village a small intersection where day people hardly walk. A large number of days of the week is Anopolis However pressure populated. Then from far and wide masses of tourists after a reception with a glass of raki to enjoy a Greek evening filled with song and dance and of course full on food and drink. After around 22:30 last tourists departed again Anopolis is back in the rest as we of so many Greek villages kennen.Maar Greek evenings are not the only tourist attractions Anopolis, because you drive into the village you see all the signs, Anopolis has many swimming pools and an amusement park with space for thousands of people. There is also a theater for all sorts of festivities can be used. In short, Anopolis as insignificant as it may seem, it's a quiet village which plays an important role in local tourism. Ano Asites, the village of fee (contribution Reinhilde Digruber) The village of Ano Asites is located 30 kilometers south of the capital Heraklion to the east of the runners from Psiloritis and has about 450 inhabitants. Just travel around there is gorgeous. Slight hills with vineyards and arable land alternate with cypresses, almond and fig trees. With each mile that you drive from the capital Heraklion to get more and more the real Crete. You notice because the paving is becoming worse, therefore, go very easy because often tap into a herd of sheep or goats right. Since our first visit we are always drawn to this village, quiet and authentic, that is probably your first impression. A tour through the small streets and alleys, we start our OPONT hold. Beautiful white painted houses, with a beautiful flower to the facades, but also very friendly using sustainable village residents who like to chat a fairly rare tourists want to make a beautiful cross-domed church and beautiful cats that we support. Our road leads to the village, along the bell smith. Then we arrive at the new tavern, where you can eat delicious oven fresh, and then against the village towards the source of Aghios Antonios. . Halfway through we discover a small corn field with also a place dors. Here you can during the tour of Manolis see how small his donkey work. Once there, the road along by vineyards, vegetable gardens, fig and almond trees and cypress trees along the two rock walls slightly uphill. On the left kand revealed a deep ravine whose walls at a height in some cave passages traps. These caves were the homes of the first inhabitants of Asites but also flight refuge during attacks by the Saracens and later against the Turks. (Ano Asites is first mentioned in 900). In one of these caves (Nichterinospileo) according to the population a whole slew of fairies lived there one whose love would become Eftchios, a mortal. Anyway, still a young girl running around in Ano Asites with blonde hair and deep blue eyes of the fairy still lives on. Just before we reach our goal, the source of Aghios Antonios brings us in a loud calling herd sheep and then we come to the source. Between huge plane has a small chapel where the spring rises. The place next to the chapel on the edge of the means become very broad and deep ravine, is an almost magical place that often has proved to have the power to open hearts. There is the legend of the little boy from Kato Asites which had become almost blind. The water from this source would have healed the boy. This story is better told by Manolis, who knows a lot more to tell. Weekly initiated Manolis rare visitors around the village. About a memorable day in Ano Sites would have to guess we asked for time with Manolis connect to. His tour also along the nearby ruins of Prinias. The culmination of this wonderful day is cozy together on the roof of Manolis' home with a fantastic view over the village and the surrounding area. Even a small tip, a few minutes by car from Ano Asites is the monastery Paliani, a great idea to visit. From the road Heraklion - Rethymnon you the signs to the monastery Arkadi follow. (Approximately 18 kilometers). The route there is via a narrow road, but the appearance and nature are beautiful, they imagine themselves in Austria on an island in the Mediterranean Sea. The monastery is the bow view of the freedom of feeling the Cretans, since in 1866 more than a thousand islanders, who are here on blowing through the more than 15,000 Turkish conquerors, but with liefst30 cannons. Not for nothing, there are many places in Crete by the street name Odos 1866 and shall not for nothing is November 18 a local holiday, the day it happened! Things just happened, Crete was around 250 years occupied by the Turks, when after many bloody revolts records the rebellion of 1866 broke out. This was what more sensitive than the other stands as the Turks began gradually their grip on Crete to lose. The Arkadi Monastery was from the beginning of the nervous system of the uprising, as was here the other committee to stand up. When the warrant holder Turkish air here, they were immediately offered scientists broadcast to the abbot of the monastery to move the resistance to breakage. If not, then the Turks will destroy the monastery, but the threats will not work in Crete. Yet the Turks sent some soldiers to advance progress made any damage in the monastery, and indeed, some monks were doubts, but not the abbot Gabriel Marinakis, which was again offer state, an attitude that the other monks were careful long taken over. The soldiers of the Greek army commander Koroneos, the inhabitants of the monastery not outvoice, and the monastery itself was totally against the Turkish enemy. Left with any doubts that they plan to make the Turks to fight .. So they grew more bees to the Turks to attack, but realized they do not have a chance against the Turkish power on. Ultimately, the Turkish rulers over and surrounded the monastery, where later two huge cannons was added. The fate of the monks seemed sealed. On November 7, the monks celebrated a Mass on November 8, the day of the attack. This attack was an appalling and that is clearly seen in the monastery. The inhabitants of the monastery had behaved heroically resisted and hard but still found the case hopeless, but when called on the abbot that they all had to pull together in the powder house, because it was better to die in the fire of the powder house than in the hands of the Turks to fall. Once when the monks in the powder house was broke hidden enemy really in the convent by, they destroyed all the gates and were in there but without a shot gun was unloaded. Once the monks were given the opportunity to flee from the powder house, but none of the departed heroes. Then Costas Giamboudakis with a torch to the powder and a great and thundering explosion followed, which all died, not only monks, but also many Turks who at that moment the gunpowder house besieged. Until today the monastery is still a fortress. A distasteful square built building. If one comes to the west wing, through the gate and then one for the heavily damaged Venetian church from 1587 (yes, that same January 1, 2002 on the ticket was 100 drachmas). The church is a high Cypres that the storm using Turks and has survived the explosion. Could this tree, but speak. We look to the left, it can be in the North west corner of the building cell of the abbot Gabriel see something more to the center, the guest house there next to the dining room, and right there next to the kitchen again. Further to the east will be in the extreme point of the room, the powder room which is still the roof off that time was blown away. The remaining parts of the building, the other monastic cells. Assuming the building completely, directly opposite the entrance to the monastery you will find enekele memories of the terrible event, the bust of the four major role players in the drama and in a knekel home the skulls of some omgekomenen. This city on the north coast between Heraklion and Rethymnon was once a very beautiful place on the beautiful bay on a peninsula located. It has an original small harbor with a small boulevard with many terraces. In nowadays there is always more up against the mountain and Bali has many of its original beauty is lost. Want to visit Bali again by public transport, bus connections are excellent, but from the new road, so the top Bali. 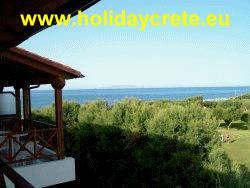 www.holidaycrete.eu: devoted much care to keep all information on the site. But incorrect information supplied and other reasons things can go wrong. 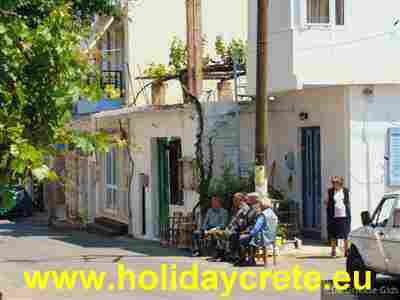 Moreover www.holidaycrete.eu is not responsible for any type and printing errors. 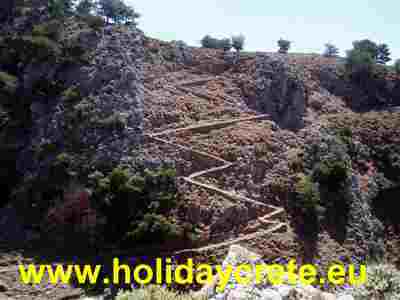 The use of the information on www.holidaycrete.eu is at your own risk. 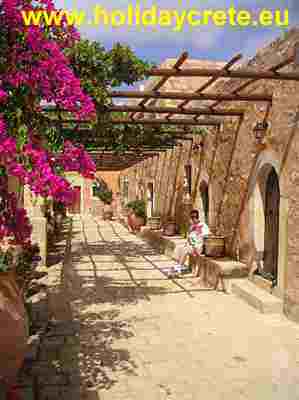 www.holidaycrete.eu: provide a service to users of the Internet by means of the state of information gathered from various sources can be found. The user is solely responsible for determining whether the information (yet) accurate and valid. 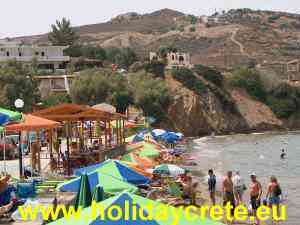 www.holidaycrete.eu can not be held responsible for consequential damage caused by the transfer to this information. www.holidaycrete.eu: is in no way responsible for the content, comparisons and interpretations of the content, comparisons and results of the websites used by www.holidaycrete.eu or via hyperlinks from www.holidaycrete.eu visited can be.